Great news for you Mitsubishi fan(s?) out there! A new 2020 Mitsubishi Outlander Sport just showed its face for the first time today. But if, for some reason, you were expecting an all-new vehicle, there’s rough news: it’s essentially a refreshed 2011 model. But honestly, that’s not totally a bad thing. I’m no platform snob. I believe that, for certain vehicles, it’s totally okay to keep using the same bones for decades at a time. That seems to hold especially true for cheap crossovers, whose buyers really don’t care about the latest weight-savings tech, and who may be more willing to give up having the snazziest-looking car on the block to save a few bills. As long as the car can be refreshed with modern safety features and more efficient powertrains, it’s probably okay. 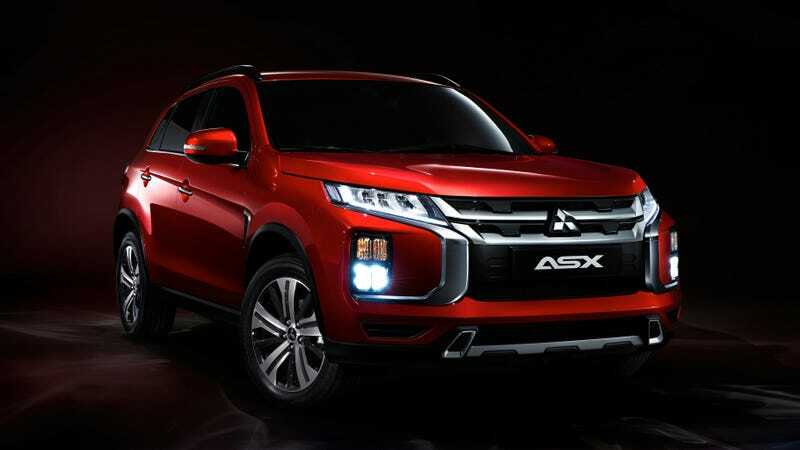 Still, when I saw Mitsubishi’s press release on the 2020 Outlander Sport (sold elsewhere as the ASX, if you were wondering about the badging), I was surprised to see that it’s clearly built on the same platform that launched in 2010 for the 2011 model year. This thing is set to be revealed at the Geneva Motor Show in March, unintentionally celebrating just over ten years that the Outlander Sport has sat on the same platform. That’s quite a stretch. “Why fix what ain’t broke?” is probably what the company is thinking. Lots of other cars out there are built on some seriously old bones, and their makers are likely thinking the same thing. Dodge’s lineup, as we’ve pointed out before, is extremely dated, with vehicles like the Durango, Journey, and Charger sitting on platforms from 2010 or earlier. There are plenty of other examples, but one that comes to mind is the Toyota Sequoia TRD Pro that debuted just last week, and that’s based on the same platform that debuted at the tail end of 2007. So the old platform itself isn’t a bad thing, especially for the bean counters, but what’s bad is if the platform causes the vehicle to continue down a path of mediocrity; my coworker Stef Schrader drove a 2017 model and wrote “I Hate The 2017 Mitsubishi Outlander Sport And Everything It Stands For”, so it sounds like this thing could use all the help it can get. I’ll have to see it in person to judge properly, but I think it looks okay. Even if it’s hiding a dated platform. Did You Know Dodge Still Makes The Journey?